True Blood’s second season showed us an interesting variety of sets. The most sinister of them all is without a doubt the eerie Fangtasia dungeon where Eric locks up his human prisoners. I asked True Blood Production Designer Suzuki Ingerslev, about this set that she designed. 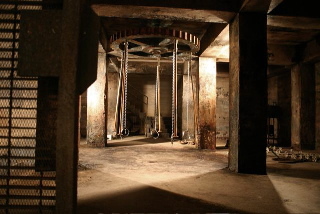 “It was definitely the writers who inspired the design of the Fangtasia basement with their grisly depiction of what they called the “Saw” room”, Suzuki answered. 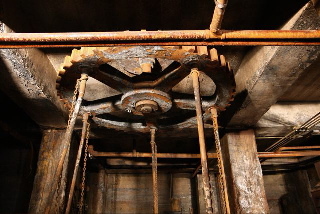 The significance and purpose of the wheel to which the prisoners are chained were discussed and speculated upon to great length on the True Blood message boards. Sometimes we try so hard to see symbolism in every scene that we overlook the obvious and simple explanation. 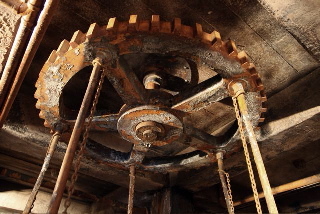 Alexander Woo explains that the purpose of the wheel is surprisingly connected to one of the primary human bodily functions. In the show it was Eric who came up with both the concept of the vampire bar Fangtasia and the torture dungeon that lies beneath it. What does this tell us about Eric’s character according to Woo? The True Blood vampires obviously all have a very dark side to them, but so do many human inhabitants of Bon Temps. The dungeon shows us the cruelty of vampire nature, I asked Alex Woo if this is really so different from the cruelty Eddie suffered in Jason’s basement? Finally I asked if he thinks that humans and vampires will ever be able to live in a somewhat peaceful coexistence. “Probably not for the life of the show. What fun would it be to watch then?” answers Woo. And I think we can all agree with that. Keep the drama coming! Photos courtesy of Suzuki Ingerslev. I love reading about the sets and how they came up with the story. Great article Shad! Well, thanks for settling the question of the purpose of the wheel. I thought it had something to do with Lost’s island disappearing. It must be a blast to bring these concepts to life. Good article. excellent, excellent scene. thank you for the vid. it was great to see it all again. great interview Shad. It is so interesting how they come up with these concepts and designs. Poor Lafayette endured such psychological and physical torture in that scary enviroment they designed so well. Cringe worthy. Thanks for this, Shad. Most interesting how the wheel and the dungeon setting came into being. It took me more than one viewing before I caught on to the significance of the bucket. The dungeon was a terrifying place, filled with horror and hopelessness. Great stuff! That dungeon gave me the heebie-jeebies, which is a total compliment to the writers for imagining it and the set decorators for bringing it to life. I could almost smell the stench through my TV. Kudos all around. I love all of the sets used for the show, whether they were created from scratch or filmed on location. I’m always impressed that they can make LA seem like the Louisiana swamp. Another great article ! Loved reading it ! I cannot wait to see what elaborate sets they will have for Season 3 . Thanks for a great interview Shad ! and putting together a great article. Kudos to the creators of this amazing set. Meant to add that to my post above. I’ll do so now. is amazing, good for the article Shandaliza, and i luv the new makeover of this site, my h♥me!!! thanks shad. 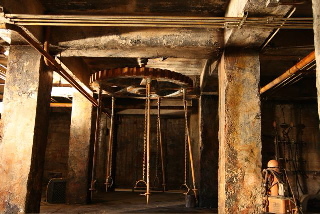 i loved the dungeon scenes and the set made it real. Fascinating article, Shad. I love learning about all the ideas and the set designs. It’s great to read about the perspectives and opinions of the designers, writers, etc. Look at everything that came about because Nelsan is such a kick*ss actor! LOL! “Eric has no insecurities about who he is” D*MN straight! That’s why we love him! This article really says alot and gives us some insight into Eric’s character, and it isn’t very pretty. That took a twisted mind to think up that. Very cool article though….love behind the scene stuff. Let’s not forget that Lafayette is a V dealer(tho we love him) at this point,(before the intro of the queen) and Royce was a vampire killing arsonist. I understand what they have done. But, no one deserves that kind of torture. I’m sure that there are Sherriff’s who would have done far worse. But, what was going on in that basement was still cruel, inhuman, and took a bit of a twisted mind to think up. Eric has his good, progressive, side. That’s what the upstairs represents. But, he also has a very dark and twisted side that he keeps hidden. That’s what the basement represents. But this is a good example of what makes the characters of TB fun and interesting. I’m not Eric bashing here. I think that Bill is the same in that he has a good side that he presents to the world and a bad side that he keeps hidden from the world. The difference between Bill and Eric is that Eric seems to embrace his bad side, whereas, Bill doesn’t. Bill seems to want to cleanse himself of the evil that exists in him. He wants to clean out his basement. Whether he can, remains to be seen. Oh give me a break, as if AB hasnt screwed Eric over enough as it is. Maybe Beehl will spend some time in the dungeon for being the queens lackey.